Training The Body or The Mind? We can talk about whether we are trying to reach a horse's mind in order to train their body, or in fact train their body in order to relax their mind, but making a distinction between body and mind is like trying to separate the music from the instrument. The way we have come to look at our training approach at HHT, is that the technique we work with is a framework, which in itself is well established. It is based on bio-mechanical principles which are supported by practical experience throughout history, as well as scientific study in the modern age. In itself it has no need to be re-invented, the interesting part is that each different horse is a unique body-mind combination which, when introduced to this framework, will produce a process entirely individual to themselves. For some horses, the 'mind' aspect will be thrown into greater relief because the issues to address in order to progress are psychologically/emotionally related. Other horses can support the focus on the physical aspects of their development because they are balanced and relaxed mentally. In reality no horse is ever a simple case of one or the other as body-mind is one intelligence which expresses itself in different ways. The important point to stress here is that the individuality of any horse can only be truly revealed and understood when the structure of the training framework is clear enough. But how can something that essentially only has one way in which it can be done properly possibly allow for such freedom of expression? The answer is that it is founded on the principles of therapeutic intention and that it must be accomplished in a force-free way. In fact these two principles serve to form the training framework even more strongly. If there is only ever one intention, the well-being of horse and human, as well as the choice not to use force, this could seem to limit the possibilities still further. Actually, it means that the structure will never bend or crack under pressure. It always supports the progress of the horse and therefore whatever is right for that horse can be addressed, and the individuality of the horse becomes clear. The definition of the word 'force' here, means not to push through a horse's boundaries. In some cases, what would be forcful for one horse is not for another. That is why the therapeutic intention is so important. 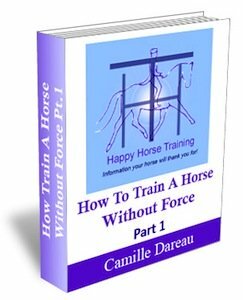 If you are training a horse with their own welfare as the only goal, forcing their boundaries no longer has any purpose (for more on respecting boudaries look at: Horse Control: Another Dimension). 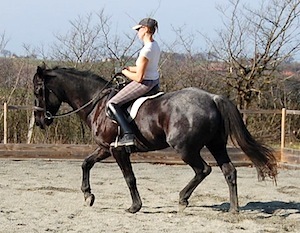 When a training technique is applied because the horse is to be the vehicle for the rider's pride i.e. recognition (even self-recognition) or power seeking, then not only will the horse's individuality not be considered, as it might come in the way of that end, but the possibility that force might be resorted to is high, and this will actively crush the horse's individuality. Our training structure (based on the principle of engagement) is like a prism which is structurally perfect, it is only what it is and no more. Each horse we work with is like a ray of light, and when we shine that light through the prism, all the different colours within it are revealed. We can rely on the structure of the prism to show us what is happening in our horses physiology, and what they may need help with and why. We can also rely on the same structure to show us the psychology of a horse, how they feel about their world and why. 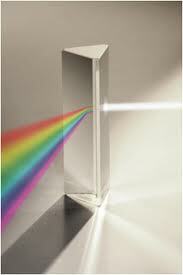 Not only this, but our prism is also a healer in many ways. It allows us to prove our good intention to our horses by making them feel good and helping them overcome their limitations. Although preserving the integrity of the prism is of utmost importance, we continue to develop our ability to read what it is giving us in each moment - to be able to see the different shades of light - and this is why the valuable potential, which is the magic, is never lost. These two horses show different expressions of engagement: put the light of each horse into the training structure, and it allows all of their individual colours to come out. In the herd each horse has their individual friends and supporters, as well as the security of the whole community. 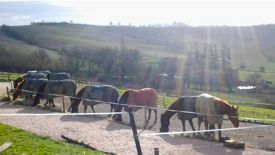 Each horse is barefoot and trimmed in a way which emulates the natural wear of the feet of horses in wild conditions. The trim follows the same criteria for each horse, but these, by definition, respect the individual. 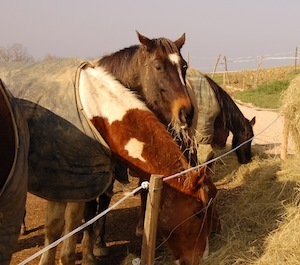 The horses all have the same basic diet, but each meal is a different mixture of each food stuff, tailored to individual needs. Because having the right intention is essential to establishing your training 'prism', it's important to be clear and honest with yourself about this first. What really inspires you about working with your horse? The importance of knowing this underlying intention in yourself cannot be underestimated, because this will shape - even without you knowing it - everything you do and are aware of in the training process, and of course in the way you care for your horse. We are not trying to moralise here - there is nothing 'wrong' with having an intention based on outer achievement, but if this is the case you must accept the fact that you will not have an inner 'prism' to guide and inform your training, instead you will be reliant on external support towards your external goal, which is not necessarily in the interests of your horse's wellbeing, or the integrity of the results you achieve. One of the clearest criteria to go by when you work your horse on the lunge is the longitudinal stretch, which is shown by the horse dropping his nose forwards and down without any auxiliary 'encouragement' (side-reins etc.). If you start to use this to guide you, you will begin to become aware of several things which go along with this stretching. The most important one is correct bending. Horses naturally bend to the outside when they turn, but because this misaligns their body to the direction of movement, they cannot simultaneously perform the longitudinal stretch. So correct stretching is reliant on sufficient bending. 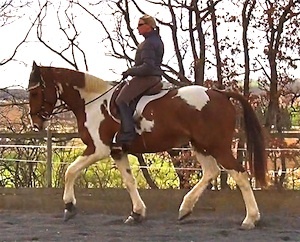 You may then become aware that you cannot help your horse to bend unless you have a steady contact in the lunge line (never attached to the bit, but always to the central nose-ring of a caveson or Micklem bridle). 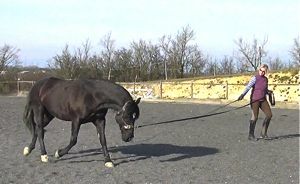 When you try to establish a steady contact, you will realize that you need to be able to use the lunge whip effectively enough to keep your horse out onto the circle, but sensitively enough not to create too much forward movement which unbalances the horse, and again negates his/her ability to stretch. In this way you can see how just that one criterion (the longitudinal stretch) informs a whole series of training procedures, but it will only do this is you stick to it for long enough and consistantly enough. Some horses stretch down easily with enough of the right guidance, others find it much harder (perhaps for conformational or other physiological or behavioural reasons) and you will need to be much more patient. This is the power of having this training structure or 'prism' to, as it were, shine the light of your horse through - it will tell you how you need to proceed, with no need for external rules on how much time it should take. Once you have felt the reality of your horse channeling his power through his body in a balanced way, you will feel how magical this transformation is, and you will want to let this magic guide everything you do. Then your awareness can become more and more subtle, for example using your conscious intention as a training tool (see How To Lunge Horse From Within). Once you have established your training prism on the ground, it is then so much easier to maintain it into your riding work, because you now have an inner 'pole star' to guide you.